← Adam Sandler & Netflix Have Agreed To A Four Movie Deal – Whoopitydo! 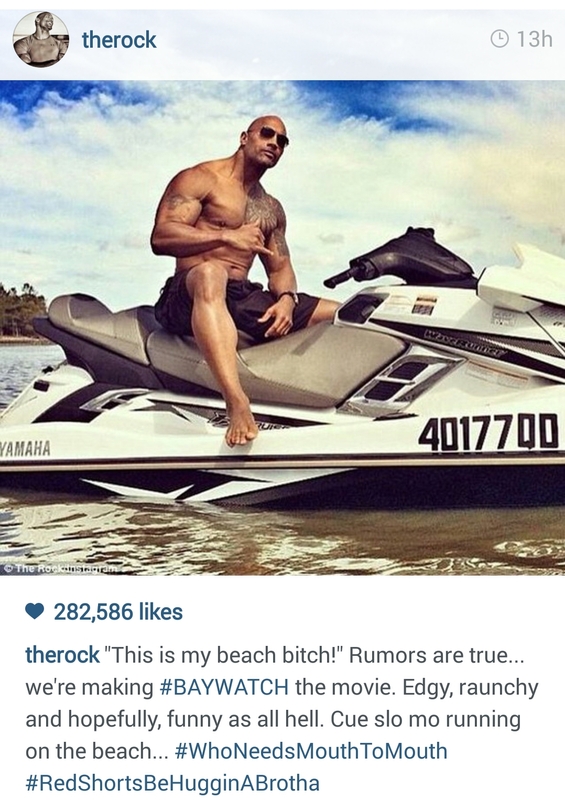 I had to do a double take when I first saw this because I thought that was me sitting on the jet ski, since The Rock and I have very similar physiques. When I say similar, I mean literally the exact opposite. The Rock is on fire in Hollywood right now. If you’re rebooting a movie franchise, or turning a popular lifeguard TV show into a movie, he is your guy. He’s a natural in front of the camera, whether it be in a WWE ring or on the big screen, so it’s no surprise his movie career is taking off. I’m definitely interested in an R rated version of Baywatch, but I hope The Rock doesn’t take the spotlight off of The Hoff, because if there’s one thing I need in my life, it’s more David Hasselhoff. Posted on October 3, 2014, in Average Blog Posts and tagged baywatch movie, david hasselhoff, dwayne johnson the rock, the rock instagram. Bookmark the permalink. 1 Comment.